Live three card poker is an exciting variant of online poker that has been around since the game of poker was conceptualized. It has gone further to grow in popularity thanks to the straightforward three card poker rules that make the game incredibly interesting and fun for all players. In fact, of all the poker games, three card poker hands, three card poker rules as well as three card poker payouts are the easiest to learn and understand. Live three card poker is very special especially due to the fact that it does not entirely rely on luck and instead leans towards elements of player skill involved in the selection of three card poker hands. Unlike other card games, live three card poker is played against the real dealer instead of the other players. Players therefore only have to worry about their own three card poker hands and the cards held by the house. Three card poker is played with a standard 52-card deck save for the Jokers. The goal of this card game is to make the best possible three card poker hand out of the three card you are dealt. It all begins when a player places a bet of either Ante or Pairs Plus or, as in most cases, both. Once all Play wagers are in, the dealer and all the players expose their hands to allow them to determine and settle losses and three card poker payouts. The dealer’s three poker hand automatically loses if it is lower than a queen high – if not, it can compete with the other player hands. On the same note, when a player’s three card poker hand wins, the player is entitled to a three card poker payout of 1:1 on both the Play and Ante bets. In the event that both player and dealer three card poker hands tie, both bets push. The game is initiated when each player places either an Ante or Pair Plus bet or both. The dealer then deals each player three cards and himself/herself three cards. Players may examine their own cards but the dealer’s cards are dealt face down. In case any player placed an Ante bet, then they must either fold or raise. In case any player chooses to fold, then Ante wager is forfeited. If a player chooses to raise, then they must place an additional Play bet, the exactly equals the Ante bet they placed. The dealer then turns over the house’s cards. To qualify, the dealer needs a queen high or better. If the dealer does have either the queen high or better they do not qualify and therefore the player will win even money on the Ante bet and the Play bet will push. 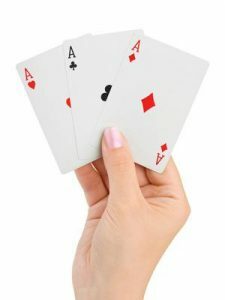 If the dealer qualifies, then the player’s three-card poker hand is compared to the dealer’s hand, and the higher hand wins. If the player has the higher poker hand then the Ante and Play will both pay even money. If the dealer has the higher poker hand then the Ante and Play will both lose. If the player and dealer tie then the Ante and Play bets will push. If the player made the Ante bet and has a straight or higher, then the player will receive an Ante Bonus, regardless of the value of the dealer’s hand. The Pair Plus bet will pay entirely based on the poker value of the player’s hand. Straight Flush – consists of three sequential cards of the same suit. Three of Kind – consists of three equally ranked cards. Straight – consists of three sequential cards. Flush – consists of three cards of the same suit. Pair – consists of two equally ranked cards. High Card or less – consists of anything that does not feature in all the previous hands. The goal of the game is to beat dealer’s three card poker hand – but to get the best out of the game, it is very advisable to keep an eye out for a Straight. This strategy takes advantage of the exception to the three card poker rules that award players an Ante Bonus if they place an Ante bet and have a straight or better regardless of the dealer’s hand strength. Another very pro tip would be to always raise your three card poker hand with Q-6-4 or conversely always fold your three card poker hand if it is lower than Q-6-4. This pro tip brings you closer to your three card poker payout by giving you the best possible chance of coming out ahead over many other three card poker hands.